David Croteau is the professor of New Testament & Greek at Columbia International University. Croteau holds a Th.M. and Ph.D. from Southeastern Baptist Theological Seminary. He is the editor and contributor to a number of books, including You Mean I don’t have to Tithe? A Biblical and Theological Analysis of Tithing (Wipf & Stock, 2010), Perspectives on Tithing (B&H Academic, 2011), and Which Bible Translation Should I Use? Leading Experts Discuss 4 Major Versions (B&H Academic, 2012). Croteau has also published several articles in Bulletin of Biblical Research and Master’s Seminary Journal. Most recently, Croteau rattles cages with the release of a challenging and yet helpful volume, Urban Legends of the New Testament: 40 Common Misconceptions (B&H Academic, 2015). 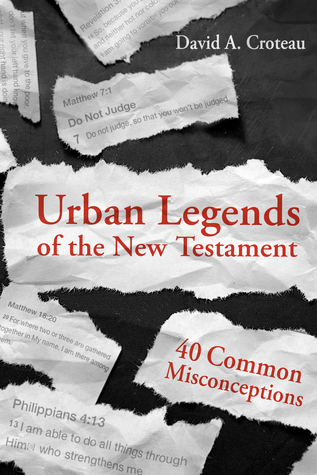 In Urban Legends of the New Testament, Croteau seeks to deconstruct 40 interpretive myths, or “urban legends,” encountered in the New Testament text. An urban legend, according to Croteau, is “a commonly circulated myth, repeated throughout the culture as common knowledge, but which isn’t true” (p. xiii). Croteau continues, “interpretations of certain passages in the New Testament have fallen victim to this. Somehow something false is stated, and it gets heard and passed down without someone checking all the facts” (p. xiii). Today many such “urban legends” exists within both the pulpit and the pews, and continue to be circulated without hesitation. It is here that Croteau embodies a clear voice of reason as he calls the reader to set aside tradition for the sake of exegesis and interpretation. Urban Legends of the New Testament tackles a number of well-known urban legends. But, Croteau also addresses some that may be less familiar to the average reader. For example, some of the urban legends include, the “Eye of a Needle” being a gate in Jerusalem (pp. 61–66) and Hell being a reference to a First-Century garbage dump near Jerusalem (pp. 49–54). Each chapter is titled after the urban legend itself, “not the correct interpretation of the text(s) at hand”(p. xiv), followed by a brief explanation. Subsequently, Croteau deconstructs each of the legends and provides a positive exegesis for his understanding of the correct interpretation. Finally, Croteau concludes each chapter with a section devoted to the application of his presentation, as well as an annotated bibliography divided by resource type (i.e. books, journals, websites, etc.) for further study. Personally I found Croteau to be both a model of integrity and a true exemplar of compassion in his handling of each of the 40 urban legends. He is engaging and consistent across the board in his treatment of these misunderstanding, and his tone is truly something to be admired. I also found the application section to be extremely helpful in processing the specific legends, especially for the pastor or teacher who would take on the responsibility of exposing such myths. Still, the reader must be fully prepared for the possibility of a challenge when picking up this book, because Urban Legends of the New Testament is sure to expose the presence of some urban legends in their own thought. Of course, if this breaks down the wall of bad hermeneutic and re-shapes a more faithful understanding of the text, who could be opposed to such challenge? In the end, if you still find yourself at ends with Croteau’s conclusion, I am confident that you will still walk away encouraged by the carefulness he exemplifies as he handles the biblical text. This book comes highly recommended!